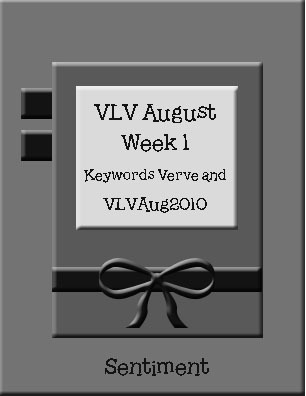 July came and went and I simply couldn't get the Viva la Verve challenges completed. 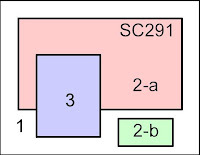 This month, Amber is using master bedrooms for our inspiration and the first room she chose really wowed me! I created my own plaid panel using a BG stamp. 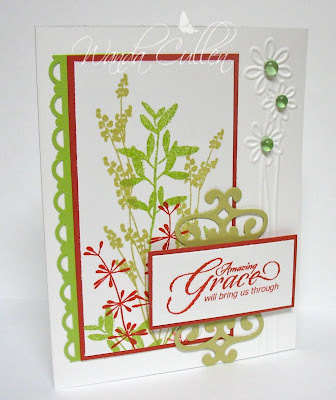 The floral panel is stamped with the new Cherry Cobbler ink from SU and it's a gorgeous red! 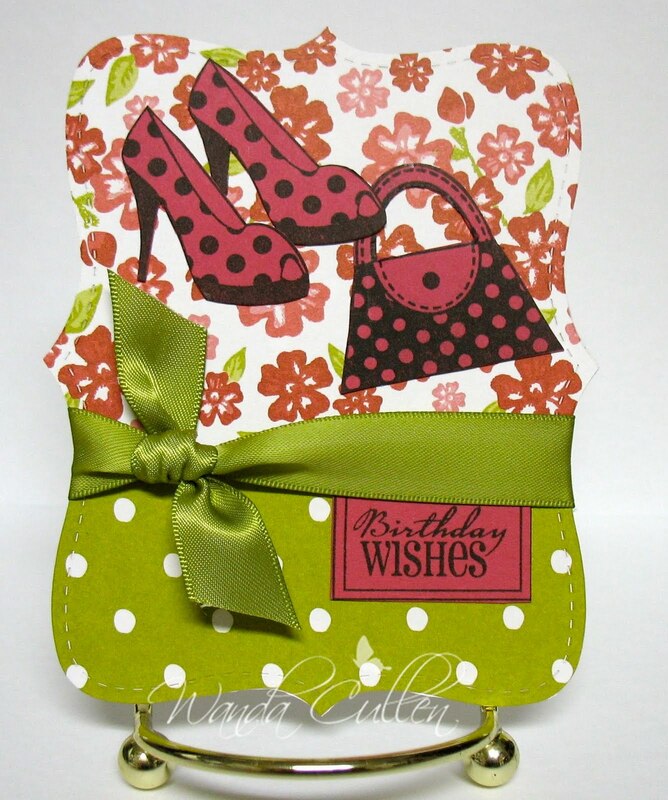 My card turned out to be busier than I wanted, but guess it's a reflection of my real life - lol! 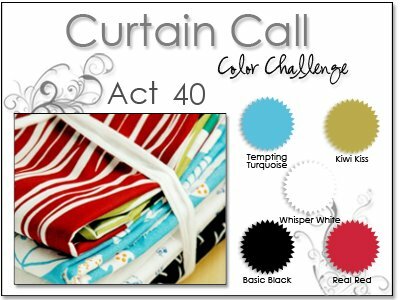 Stacey's Curtain Call Challenge for this week is to use Tempting Turquoise, Kiwi Kiss, Real Red, & Black. I struggled to know what to do with red and turquoise together, but found this DP that helped jump start my mojo. The flower is a PTI Blossoms II die with the center from an unknown source - just something I've had in my stash for years. The black BG was embossed then sanded to let a bit of the core color come through. Thanks for stopping by...I'm waiting for the furniture people to deliver my new dining room goodies now that the room is painted. If you haven't signed up to follow the Color Throwdown group on Facebook...you really must check it out! They are sneak peekin' the colors for Wednesday on Tuesday evening on FB. 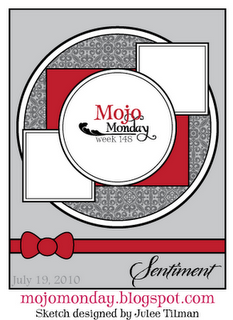 This week it's River Rock, Riding Hood Red & Certainly Celery. Roxie had her sketch challenge posted early on SCS, so this was perfect for me to combine the 2 challenges when I got home from work at 11 p.m. I used a new PTI set that I just love; it has so many different possibilities - it's like flower arranging on paper! I flipped the sketch to fit my images better. 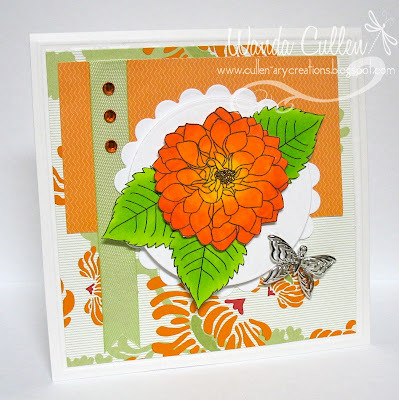 Haven't used dew drops in months and have used them on 2 cards already today. 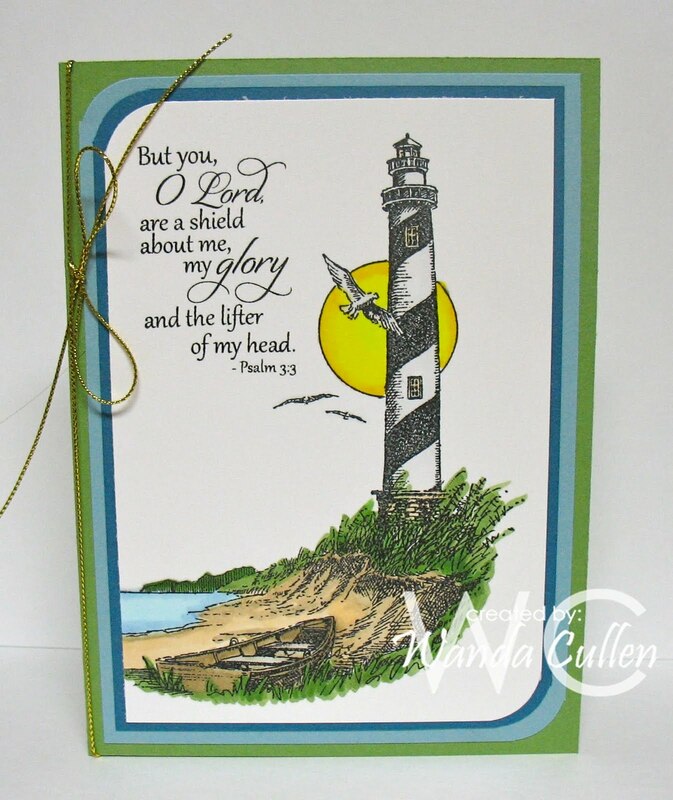 :-) The sentiment is a new Plain Jane from Verve...don't ya just love the font?! I used Mercy Kerin's sketch for the layout and used Betty Wright's Color Challenge on SCS (Daffodil Delight, Crushed Concord, Pear Pizazz) to create this baby card. The crushed concord BG was CB'd using the Square Lattice EF - love this new texture! The bear and the sentiment were stamped in Elegant Eggplant since I don't own the new ink pads. I used Copic marker BV04 to color in the sentiment and edged the bear with Copic marker Y21. The dessert option for the CC was to use dew drops. I had forgotten about them and was glad to dust them off and use them again. 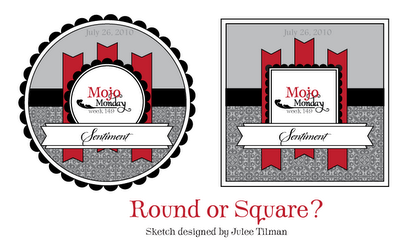 It's another Monday, so that means it's Mojo Monday sketch challenge time. 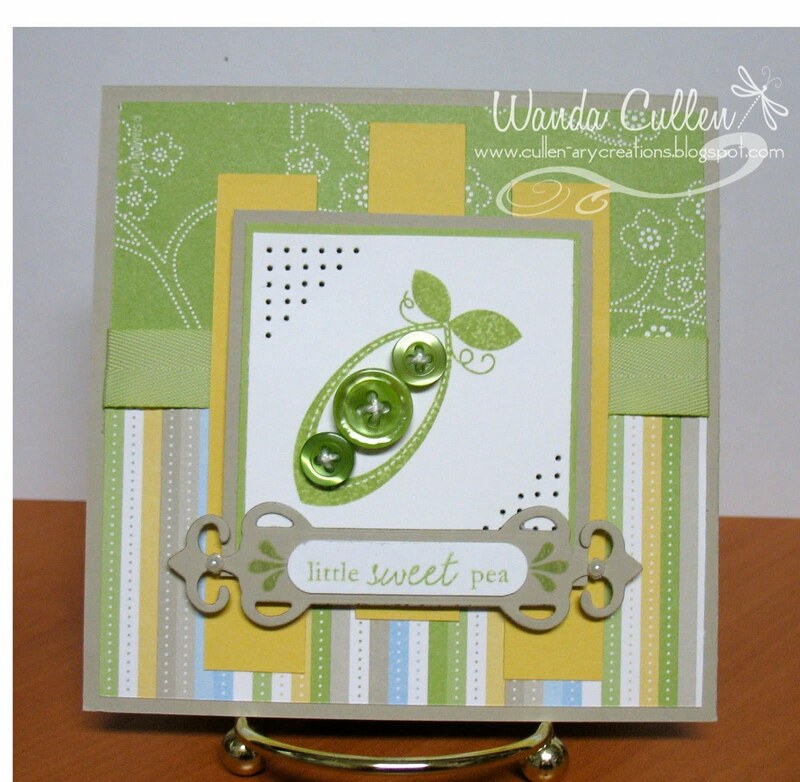 This was a fun one to use with an image from a PTI set that I just ordered...love the button bits images...they're just so cute! 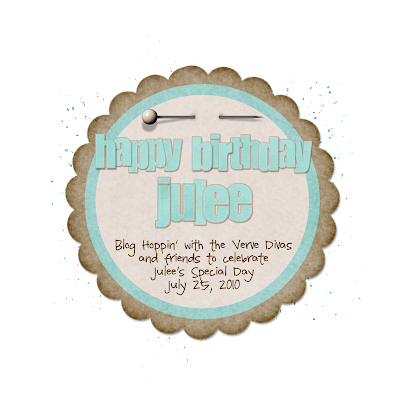 If you're arriving here from Mercy's blog, then you're right on track for the birthday hop...if you stopped by randomly, then you'll want to head over to the Verve blog for the master list which starts with Amber Hight. 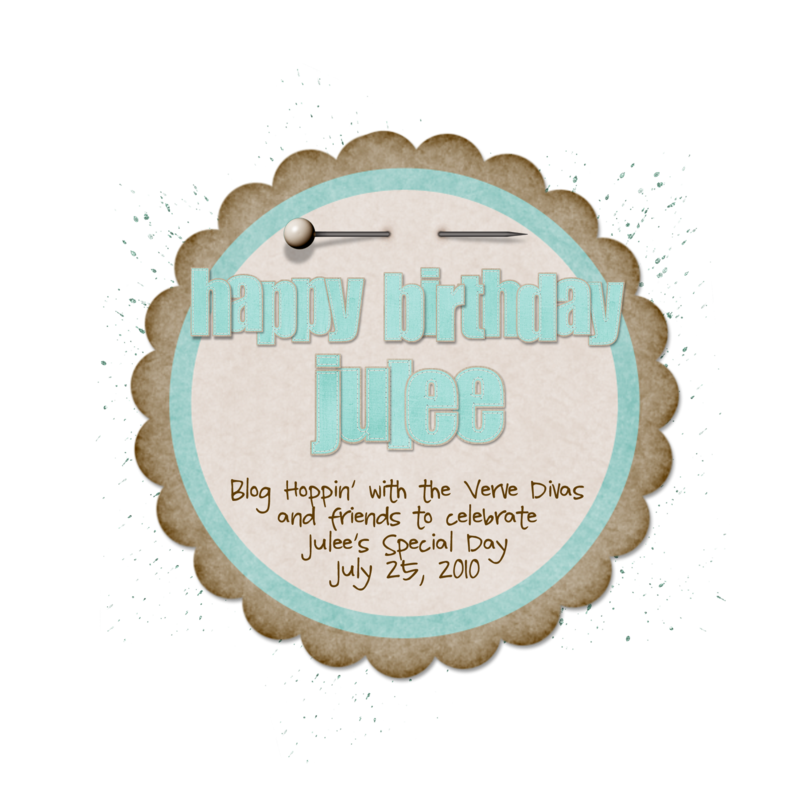 I was thrilled when Amber asked me to join in the birthday blog hop for Julee! Now I'll have to tell you, the thought of creating in the company of the awesome divas was a little intimidating, but I'm such a big fan of Verve that there was no way I was going to say no. 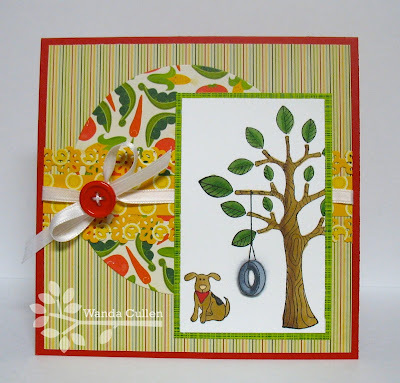 I decided to go with a tent topper card which fits into a standard A-2 envelope. The flower was colored with Copics, cut out and popped with dimensionals. It's one of my fave flowers from Julee's designs and I love the flourish in the BG that mimics the DP design. 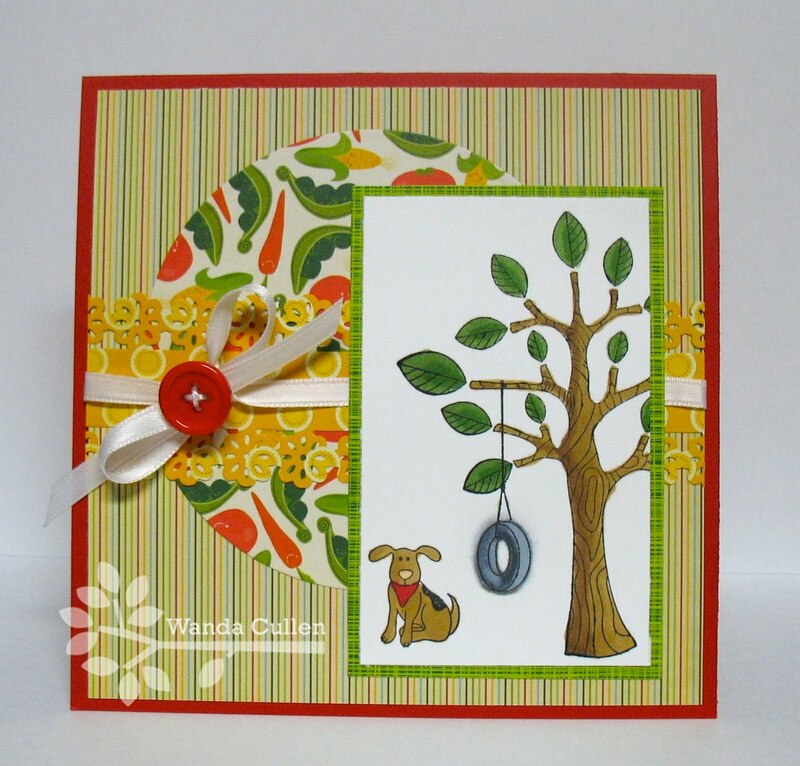 From here, you'll want to hop to Amy Sheffer's blog to see the fantabulous card she has created! This card finishes up the 33 DTGD challenges! This is my first year to participate and though it was fun...it kept me hopping! 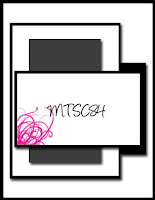 Now I can try to comment on other cards instead of creating all the time. 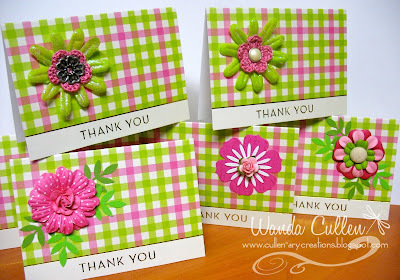 This is for Floral, Feminine & Flirty by Edna15 and for Birthdays: All Shapes & Sizes by tiffguam. Two more challenges done for the DTGD week at SCS! When I was growing up in a rural town in Ohio, my parents always had a vegetable garden and we canned and froze many different fruits and veggies. 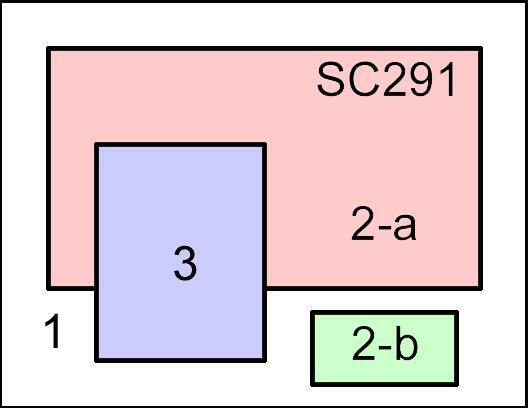 Beside the garden was a huge tree that had a tire swing in it and I spent many hours of play on that swing! 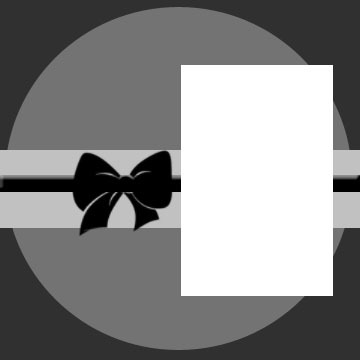 I had to tweak the circle and rectangle a bit to make my elements fit together. TGIF and I have a day off! It's going to be a hot one again...stay cool all my blogger friends! 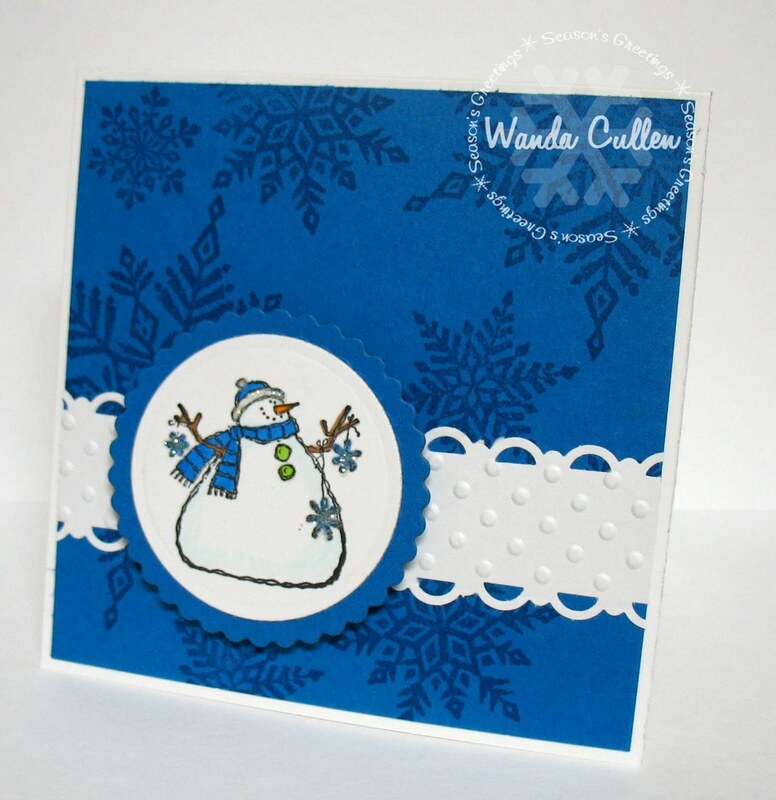 The snowflakes were stamped with Pacific Point ink on Pacific Point CS. The image is an old fave - colored with Copics and Dazzling Diamonds added. 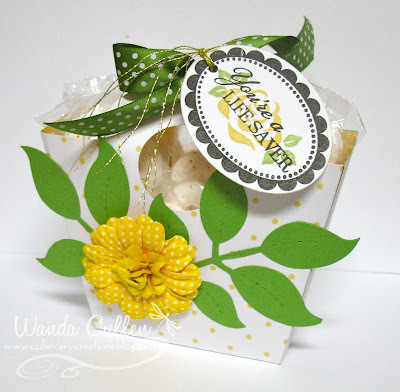 LodiChick challenged us on to make a treat gift for any reason/season on another DTGD challenge. 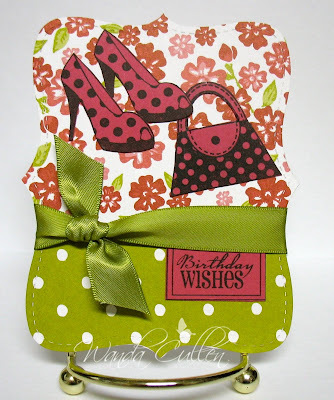 I love this easy bucket purse template that can be downloaded HERE. Some minimal scoring and cutting and you have a cute gift 'basket' for so many occasions. I filled mine with Lifesaver candies and attached the Verve sentiment on a tag. 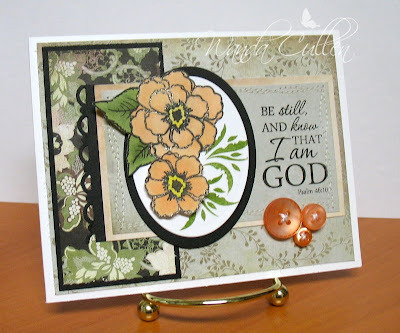 This DTGD challenge by debbiedee is to alter an item around your house. I bought this package of 10 Thank You cards awhile back at Target. 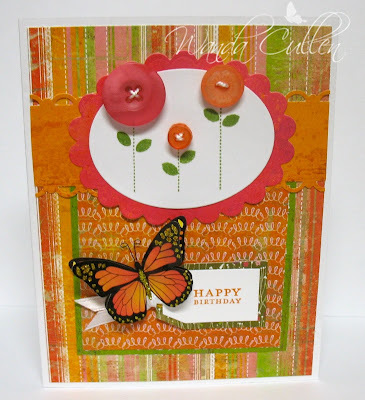 I loved the bright, summery colors and thought I'd add embellishments one day to perk them even more. This challenge was just the push I needed to accomplish that goal. 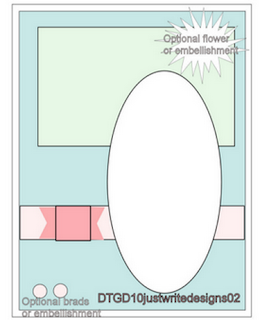 I used a variety of primas, hand-crocheted flowers, and die cut flowers. So... it's off to bed I go...will be getting up early in the morning to welcome the man who will remove my dining room wallpaper. Good night! I generally zigzag when I sew on paper, but wanted to try my hand at the drunken stitch...well...that's not the official name for it, but with the weaving lines...you get the idea! I used a scallop border punch and Nestie dies, so that checks off 2 more challenges for this week. 20 done...13 to go! 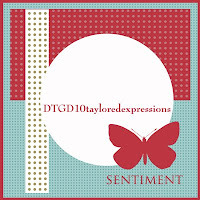 I squeezed in another DTGD challenge before heading to work...this DVD sleeve is easy to make and serves as pretty packaging - Toy's challenge for DTGD. I used movie ticket DP by Tim Holtz and because the wrap covers a movie, it qualifies for Suzanne Dean's DTGD 'At the Movies' challenge as well. 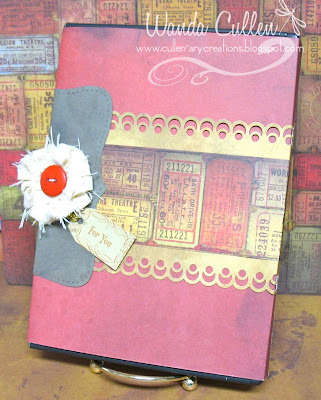 The shabby flower was created from wide twill tape (for directions, see the link in my side bar to Jenni's tutorial). I'll have to admit I cringe when I combine pinks/reds with orange but found BasicGrey's Green at Heart pad saved the day! If you haven't already, join in the fun this week and dare to get dirty, too! You need to be a fan club member, but that's easy to do and so worth it to join! Look for details HERE. 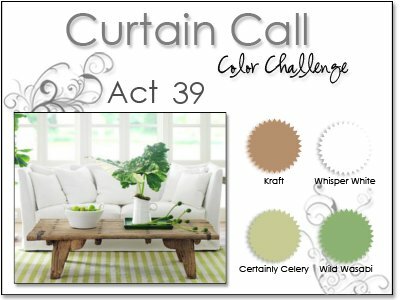 Loved the earthy Curtain Call colors this week: Kraft, White, Certainly Celery, & Wild Wasabi. 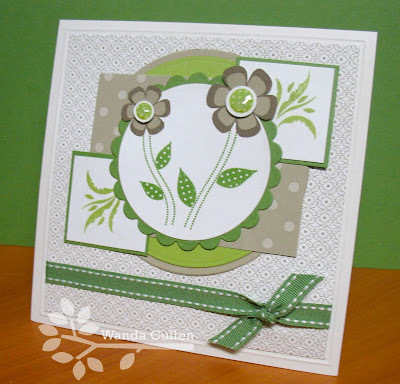 I used Julee Tilman's Mojo Monday sketch for the layout and wanted to play in her monthly set challenge: Petals & Stems. I was so excited to find the post last evening that I had won last month's set challenge using the Seeing Stars set...woohoo...$30 GC to spend on more Verve! Ahh...I'm digressing...back to the mojo card...I subbed sahara sand for kraft since I had DP in that color. I added Crystal Effects to the flower centers & otherwise, my card is pretty self-explanatory. STAMPS: Petals & Stems Verve), One Person (Verve) - flourishes. 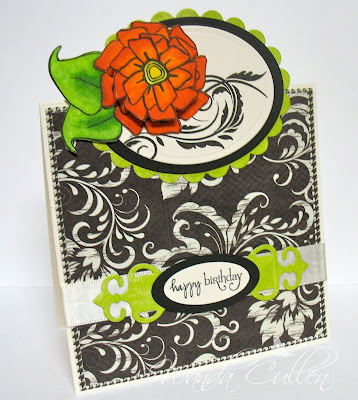 CTD 101 - LOVE these colors! It's Party Time at Color Throwdown!